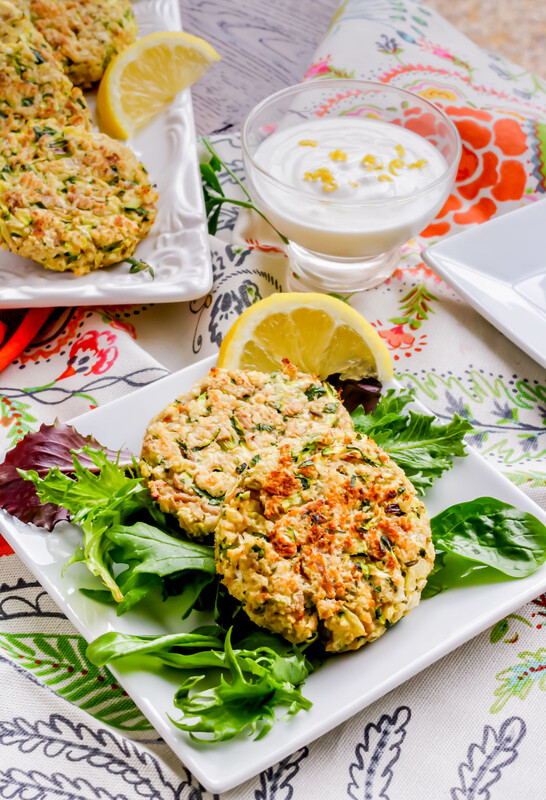 Baked Tuna and Zucchini Cakes with Lemon-Yogurt Dressing have a great spring vibe you’ll love. Soon it’ll be the time of year when we’re up to our eyeballs in zucchini. Get a jump on things and makes these now, and later! I spend a lot of time on Pinterest. You too? It’s fun to be inspired by all the goodies you could ever want to find. And, hey! If you don’t already, follow me on Pinterest to see what I share! For some reason, it seems like I’m at my hungriest on the weekend, which also happens to be prime Pinterest perusal time for me. I was cruising some zucchini recipes, and was inspired to make these simple, baked tuna and zucchini cakes with lemon-yogurt dressing. I had green onions (still!) and parsley in my garden, a few lemons left on the tree, zucchini in the fridge (perfect to use to make tortilla-crusted zucchini fries – also baked), tuna in the pantry, and some ricotta cheese in the fridge. So instead of just drooling over things like Champagne sangria, oven-ready S’mores, and homemade blackberry frozen yogurt on Pinterest — not that there’s anything wrong with that — I decided to make these yummy cakes! One of the best things about these cakes is that they’re baked instead of fried. You’ll also love all the fresh flavors tucked inside. The lemon juice brightens them up, especially the dressing that is so easy to make. The fresh herbs go well with the tuna and zucchini, and with that, you’ll love to serve these as part of a light meal, or even as an afternoon snack. For another great zucchini recipe, try my Zucchini, Mushroom, and Thyme Strata. It’s wonderful for brunch, or as part of a lighter dinner served along with a fresh salad. 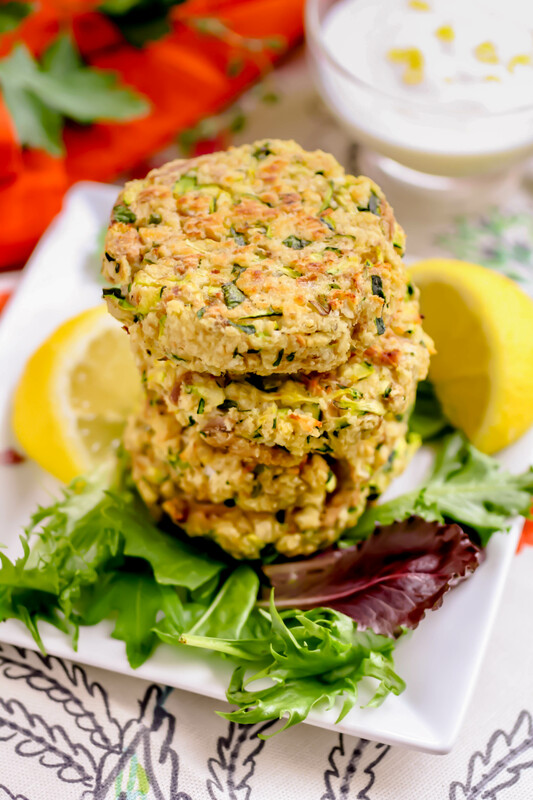 I hope you enjoy a bit of spring in these baked tuna and zucchini cakes with lemon-yogurt dressing! Serve them with a salad or your favorite soup to make them part of your next meal! Preheat your oven to 375 degrees F. Line two baking sheets with parchment paper and set aside. Add the butter to a saucepan over medium-high heat. Sauté the white onion until soft. Add the garlic and cook for about 30 seconds. Remove the pan from the heat. In a large bowl, add the tuna, green onion, zucchini, egg, cheese, lemon juice, seasonings and breadcrumbs. Shape the mixture into patties, about 1/2-inch thick and 3 inches in diameter. Place patties on the baking sheet and bake for 7-10 minutes on one side until lightly golden, then flip and continue for another 7-10 minutes. Mix all the ingredients together. Taste and adjust the seasoning as needed. Chill before serving. I'm a little in love with them : ) They're really good! these sound right up my alley! yum!! Bonus: They're easy to make! These look very delicious! We have a similar dish in Turkish cooking where we add dill and crumbled feta cheese to grated zucchini. Look forward to trying yours! That sounds delicious! It would be easy to make the substitution - maybe I'll try that next time! Thanks for the good info & visiting! Great minds, Jacob! Your simple sauce sounds good, too! I don't think I would have ever thought to combine tuna and zucchini, but it sounds like a tasty dish! I would love to try this! Hi Leah! Not the first thing that might cross the mind, but I loooove this combo! Thanks so much! Great alternative to the more expensive crab cakes! I know my hsuband would adore these!! Can't wait to make them! Thanks, Kim! These are really tasty! Hope you enjoy them! I cant wait to try this. Thanks for posting this. OMG! These look so good!! This a great recipe. I know one of my friend would try this. I will pass on this recipe to her. Thanks so much, Gunjan! I hope your friend will like it! These look absolutely delish! I love zucchini but not the hugest fan of tuna. But this recipe sounds and looks like winner. These look so yummy, and it would also be a dish I can share with my one year old. Thanks so much, Karen! I hope you give these a try and your little one enjoys them, too! This looks delicious!! I love the photos!! I will show this to my husband. He loves to cook!! Thanks so much, Jessica! I hope you husband will give this recipe a try! These photos make me want to reach in to the screen to eat them! They look delicious. Thanks, Sarah! They're easy to make -- hope you give them a try! These look really good. 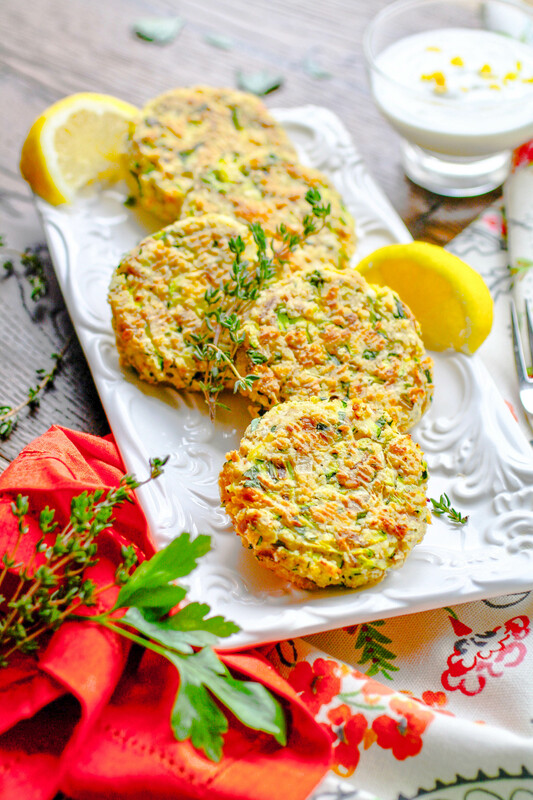 I love salmon cakes, so these are right up my alley! Thanks for sharing! Thanks, Keoshia! Hope you give them a try! Thanks, Amrita! I hope you love them like I do! Thanks so much, Carla! Maybe some cottage cheese? I'd try the small curd, as I think it's a little less watery. Let me know if you try it! YUMMMM! Tuna and lemon are two foods that my daughter Chloe and I REALLY LOVE! I will have to give this recipe a whirl in the very near future! Looks excellent! That's great to hear, Kimmy! I hope you both enjoy these! Thanks, Mimi! I really love them! Such a great recipe to use in season veggies! Yes, for sure! Thanks, Paula! Thank you, Jenna! I hope you try them, and you both enjoy them! So glad I found this recipe! I love the combo of tuna and zucchini! Thank you, Jenn! So good, for sure! I hope you like these! Wow, these sound so flavorful! Great idea to add zucchini to them. Yum! These sound great and the yogurt dressing sounds perfect to go with these! That happens to me too when I peruse Pinterest late at night. 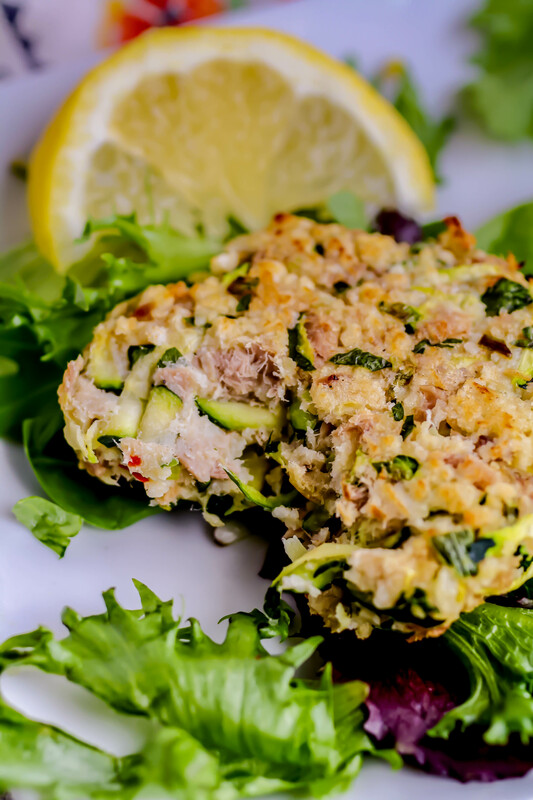 Glad you found inspiration to make these fantastic tuna and zucchini cakes!!! Haha! I love Pinterest, but for sure it can be dangerous! :) Thanks, Lora! I love how you’ve transformed a can of tuna here into something so pretty and elegant. With all that color and texture, I bet these didn’t last long on that plate! Thanks so much, Jen! They really are yummy! These are perfect for lunch!! They looks so good. Beautiful photos. Pinning! Thanks so much, Chrissie! I hope you like them! These look SO good! I love zucchini and can’t wait to try these. Pinned! Thanks, Bee! I hope you like them! These tuna cakes are so perfect for lunch or appetizer! They look so tasty! Thanks so much, Catalina! Yes - they're perfect as a light meal or snack!